WITH THEIR stylised lace leaves and textured knot stitches, worked in a bright green yarn, these socks have a pretty, botanical look. 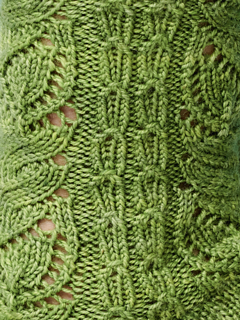 Jane Burns’ design is knitted from the top down, using a lace pattern that naturally forms an attractive, sinuous cast-on edge. A slip-stitch heel flap adds durability to the sock. Shown in SweetGeorgia CashLuxe Fine ‘Lettuce Wrap’ colourway. All sizes require one skein.